SINGAPORE, Apr 24, 2018 - (Media OutReach) - OKI will unveil two brand new label printer models at the Labelexpo Southeast Asia 2018, at Booth F21, from 10-12 May, at the Bangkok International Trade & Exhibition Centre (BITEC) in Thailand. Focusing on the growth of evolving markets, the new Pro1040 and Pro1050, represent OKI's latest innovation in label printing technology, and both Pro Series label models are expected to strengthen the company's foothold within the printing and packaging industry in the region - the Japanese company is already a leading B2B electronics manufacturer renowned for creating and selling business printers globally. The Pro1040 and Pro1050 are narrow-format label printers made for users who need on-demand printing that is easy to set-up and require minimal training to use. The printers are built for in-house use (print-for-use) and help cater to, customers who desire a wider choice of label designs yet print a lower print-volume to reduce label stock and wastage. Now, users can take their label creativity and flexibility to new levels with professional four- or five-colour printing across a range of materials with true simplicity. The Pro1040 prints in CMYK, whilst the Pro1050 prints in CMYK plus White (CMYK+W). With the White toner, users have the added advantage of printing on transparent or coloured label media - this is done by printing an opaque white background under the CMYK image, thus making printed labels stand out even more, brilliantly. With unrivalled media handling capability, printing on a huge range of media - from textured papers and synthetics, with white, clear, opaque or coloured substrates - is easier than ever. 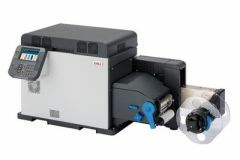 The Pro Series Label Printer handles with ease new types of materials that inkjet label printers simply struggle with, allowing businesses to take on creative ideas and complex job-types. The Pro1040 and Pro1050 can produce waterproof labels that have been tested to survive underwater, and are robust and resistant to UV fading, thus making them the ideal solution for industrial chemical labelling and for producing asset tracking labels. Whether the job is for outdoor-use labels, freezer and cold-storage labels, or labels for packaging, beverages and household goods, the Pro Series Label Printer does it all. The inaugural Labelexpo Southeast Asia show offers a unique businesses opportunity for industry stakeholders in Southeast Asia and across the wider region, thus representatives from OKI sales offices in the region - handling markets in Southeast Asia, including Hong Kong and India - as well as key personnel from its headquarters in Japan, will be present at the show. Visitors to the OKI booth (F21) will enjoy live demonstrations and learn about OKI's latest label trends and technologies.